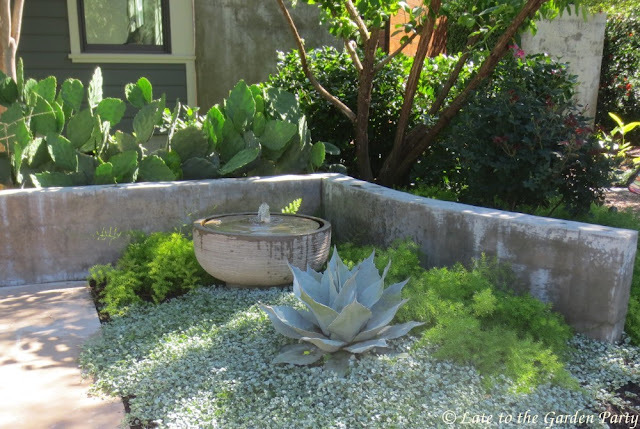 It's my second day home after attending the Garden Bloggers' Fling in Austin, Texas and my attention is already flying in so many different directions my head is spinning. I took over 900 photos and it's going to take time to sift through them but I picked a selection of them to provide you a sense of the event. However, like many of the postcards I sent in days of old, their delivery was delayed. The event began with a welcome dinner at Austin's Central Library, which is surrounded by a very nice garden and also boasts a roof-top garden space. On the first full day of the Fling, Friday, May 4th, we loaded buses under a cloudy sky and threat of rain. 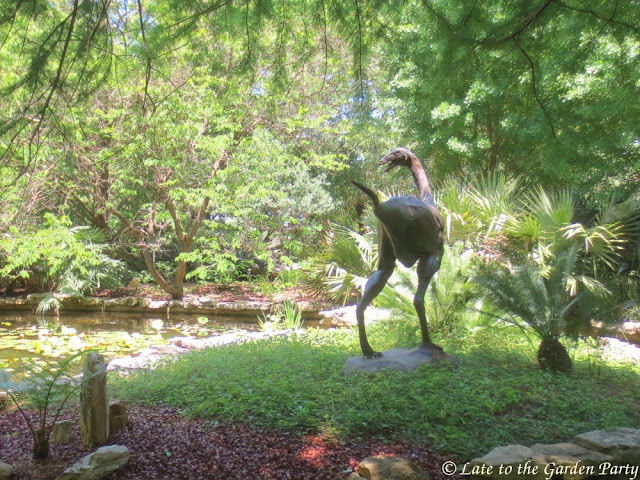 Our first stop was the Lady Bird Johnson Wildflower Center, a spot I've admired in posts by Texas bloggers and long wished to visit. Unfortunately, the skies opened up shortly after our arrival. It was a deluge, at least by the viewpoint of this rain-starved Californian. We got soaked. Our Fling hosts included a rain poncho in each swag bag provided upon arrival. I delayed a bit in putting it on, thinking my umbrella would be enough to protect me. I was wrong but then even those who donned their ponchos more promptly got soaked. I was near the Dinosaur Creek shown here when the rain turned into a downpour. The rain persisted all day, although it tempered a bit in the afternoon. Our next stop was Diana Kirby's garden. Diana was one of this year's dedicated Fling organizers and she's a landscape designer. 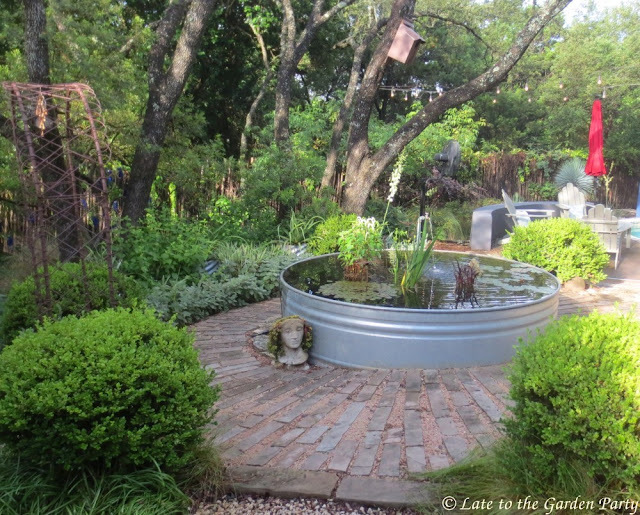 I looked forward to seeing her garden, which I've only viewed in bits and pieces on her blog but the deluge continued and limited my exploration. Diana kindly allowed 90 seriously soggy garden bloggers to hang out in her house dripping all over her floors as we hoped for a break in the rain that didn't come. This view is from the front entry of her house. Our next stop was The Natural Gardener, an acclaimed local nursery. The site offered demonstration gardens, an opportunity to shop, and hosted our lunch. I briefly ventured outside to walk through some of the demonstration gardens (shown above) as it continued to pour. After lunch, my bus headed to Jenny Stocker's garden. 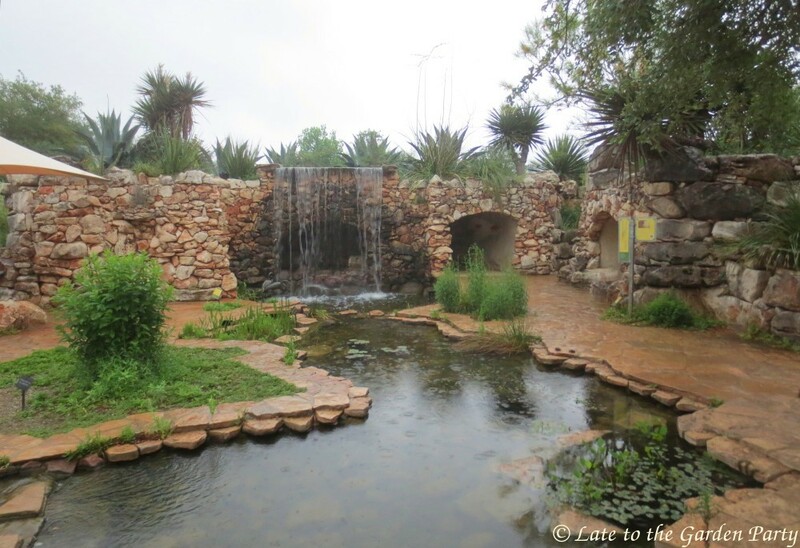 Jenny blogs as Rock Rose and I've been following her posts since I began blogging in 2012. 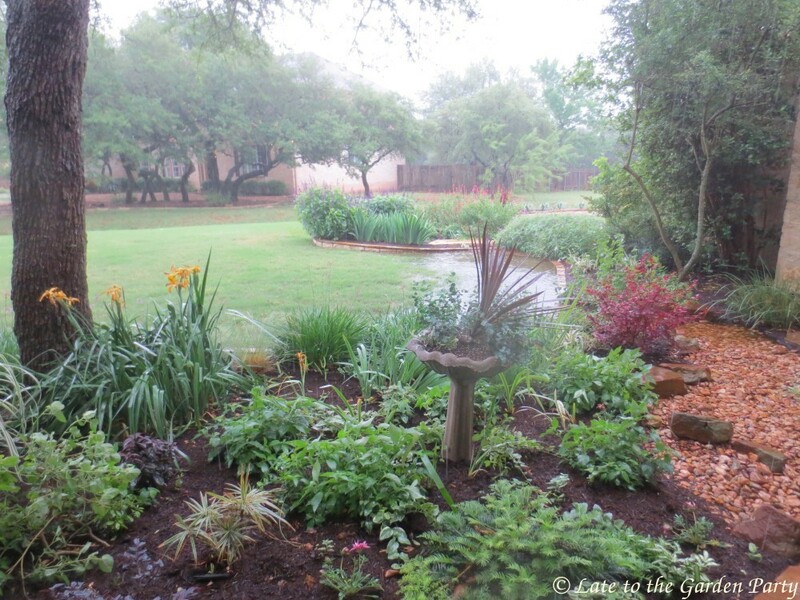 Her garden was rain-soaked but a lessening of the downpour allowed more wandering. This shot was taken outside the garden walls that break the garden into distinct rooms and protect the interior area from deer. 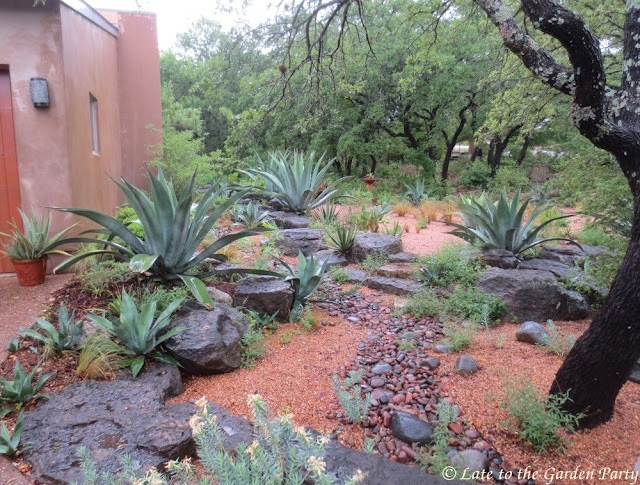 Our last stop on Friday was the private Mirador garden installed in 2013 and designed by Curt Arnette of Sitio Design. Steel retaining walls and structures were used throughout the property. 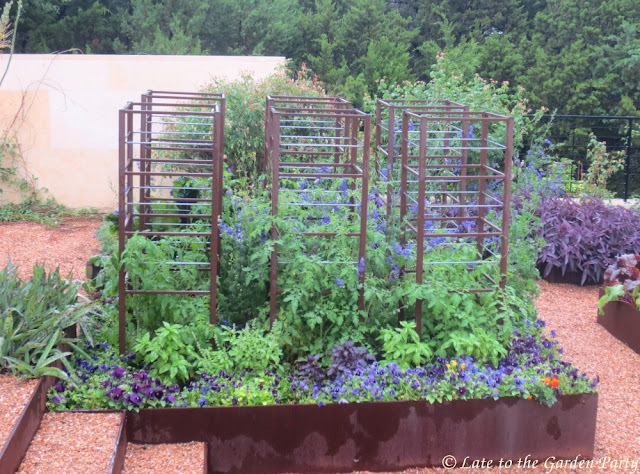 The steel tomato cages shown here garnered a lot of envious comments from my fellow bloggers. We enjoyed beautiful weather on day #2. Even the humidity remained at a reasonable level. My bus started off the day at Pam Penick's garden. Pam was one of this year's Fling organizers and is heralded as the "godmother" of the Fling. The first Fling was held in Austin in 2008 and the current Fling celebrated its tenth anniversary. This is Pam's stock tank pond, a focal point in her back garden. At this point, I began kicking myself for relying on my small PowerShot camera again this year. 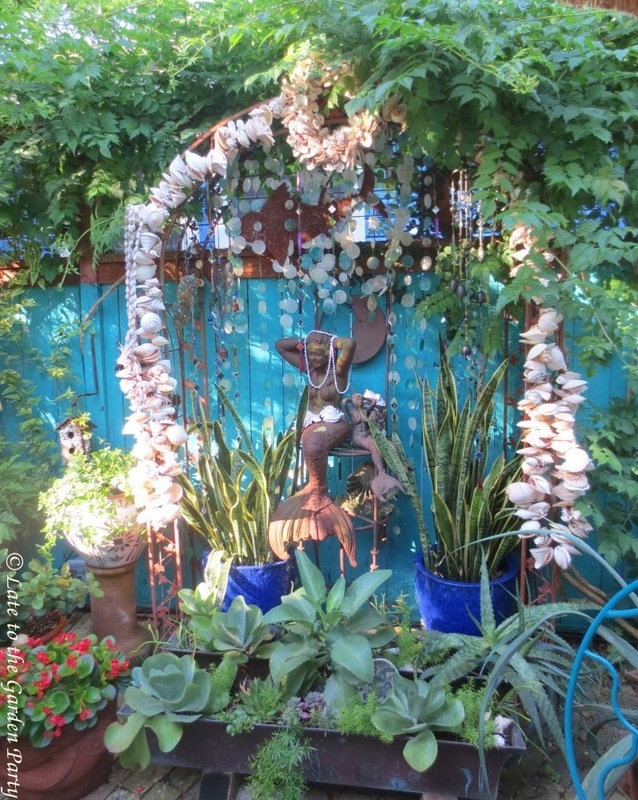 This photo was taken at our next stop, the personal garden of the owner and operator of B. Jane Gardens, a design firm. The combination of water, an agave and Dichondra argentea (aka ponyfoot) strikes me as a classic Texas trio. I've tried using this Dichondra as a ground cover in my own garden but it never looks as healthy and full as it does in the Austin gardens I toured last week. Our next host, Colleen Jamison, built not only an extensive garden of her own but also planted a very large parking median that divides her street. 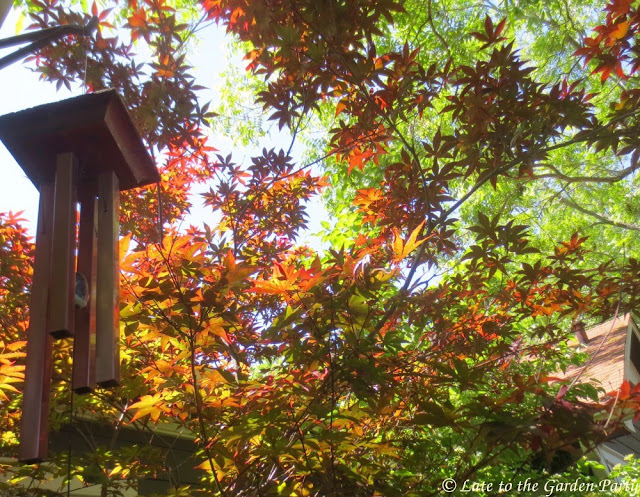 This photo shows the canopy of a beautiful Japanese maple that adorns her back garden. I was surprised at just how many incredible Japanese maples I saw on this trip. The trees struggle in my own climate. 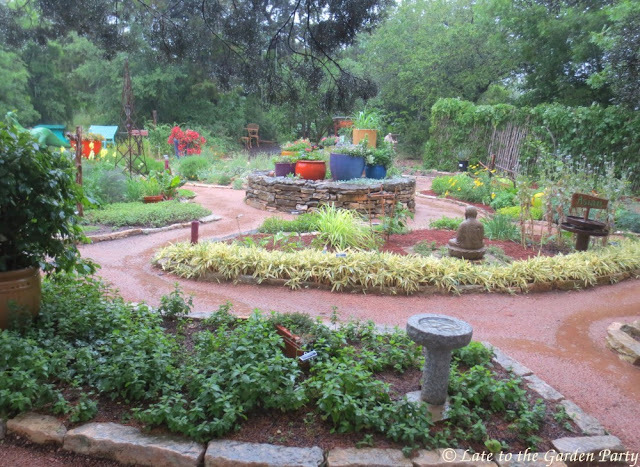 Donna Fowler's garden in Hutto, an Austin suburb, was a sprawling property that looked to be designed to host parties. It offered lots of spots for the bloggers to settle with their boxed lunches. 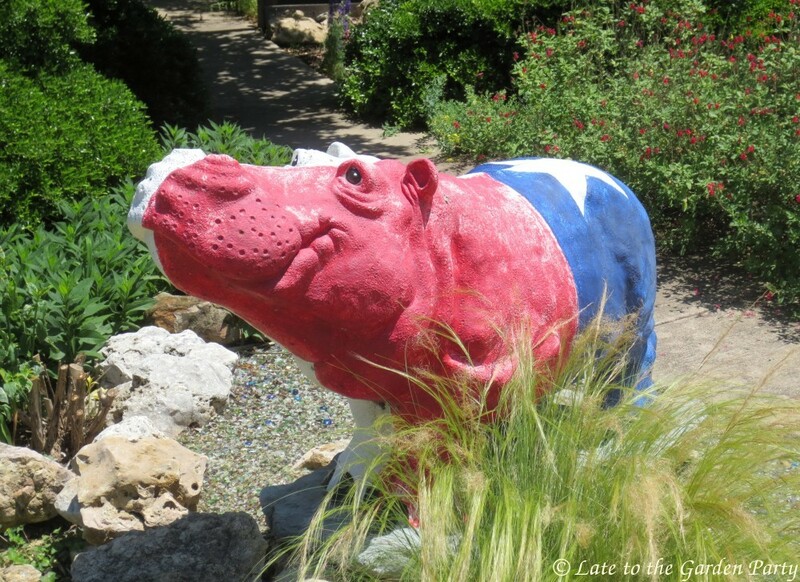 The hippo sculptures scattered about were among my favorite features. This one was painted with emblems of the state's lone star flag. Our last stop on day #2 was Tanglewild Gardens, which featured the owners' burgeoning daylily collection, the first step toward the creation of a future daylily nursery. Relatively few daylilies were in bloom at the time of our visit but the property was an impressive work-in-progress. 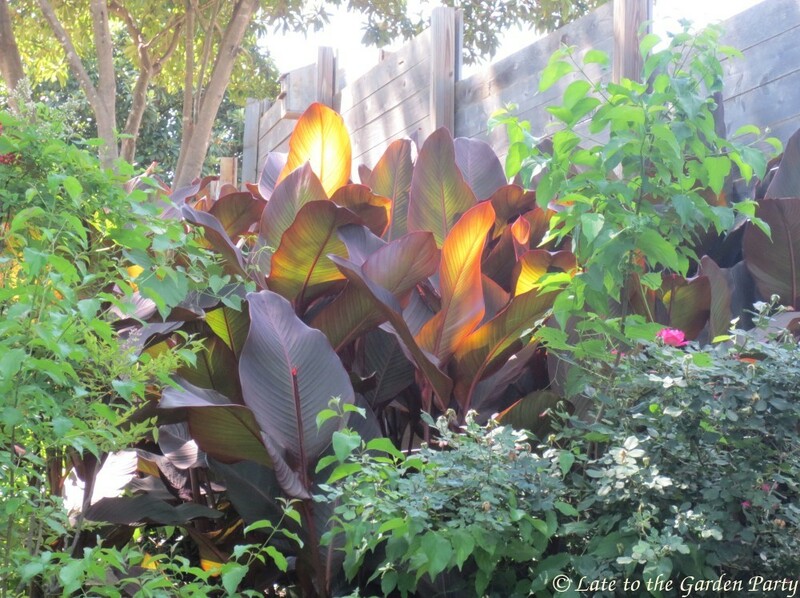 The effect of sun glowing through the leaves of canna plants had me rethinking my failure to grow any in my own garden. We enjoyed a Cinco de Mayo banquet Saturday night, complete with a pinata. There was also a raffle drawing. I won a garden book I'd had on my wish list, as well as a CobraHead weeder. As I already had one of these, I gave the weeder to a fellow blogger. The last day of the Fling on Sunday had a jam-packed schedule. We left the hotel at 8am and returned around 8pm. Our first stop was Lucinda Hutson's incredible home and garden, filled with unique vignettes inside and out. This is a photo from her mermaid grotto. Characterizing this garden is almost impossible as it's unlike anything else I've ever seen. I've been unable to come up with a description to encapsulate it other than marvelous. The next stop was Ruthie Burrus's garden, which overlooks downtown Austin. 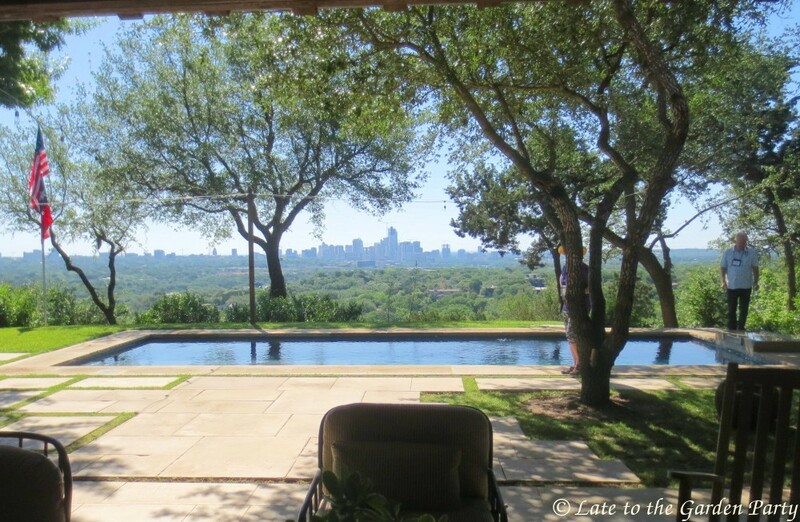 The view from her backyard patio was nothing short of incredible. Margie McClurg's courtyard garden was full of delicious shade, which we appreciated as the day grew warmer. I was drawn to the Piper auritum (aka root beer plant) growing there. I remember seeing this plant for sale at a Santa Barbara garden center. I passed on it at the time and now wish I hadn't. 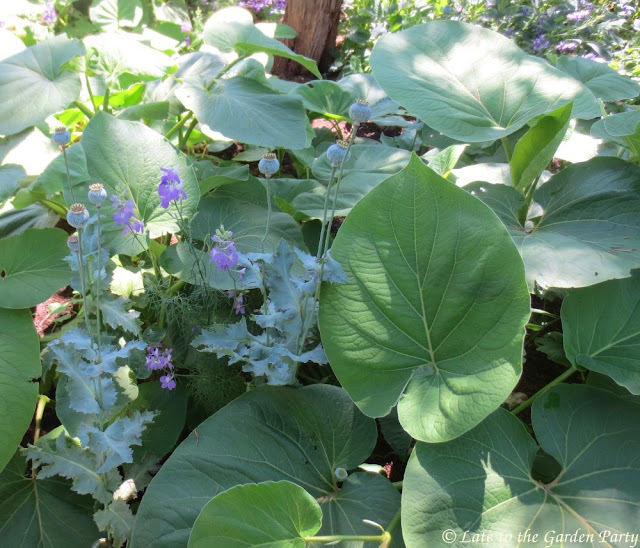 Plants with large leaves that can grow in my climate, as this one reportedly can, are hard to come by. We had lunch at Zilker Botanical Garden and I toured the Japanese and prehistoric gardens afterwards. This is a life-like representation of the Ornitomimid dinosaur that roamed the Austin area millions of years ago. Landscape architect Tait Morning's garden was up next. It was a large garden, full of shade-covered paths winding through natural areas. 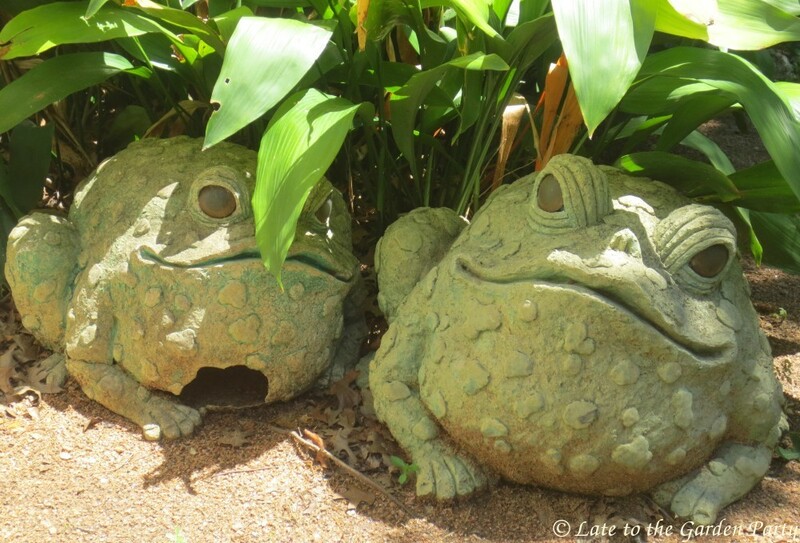 These 2 ceramic toads sheltering under leaves in the hot afternoon sun caught my eye. The last garden we toured was that of Kirk Walden. The backyard view seen here was a huge draw. A spa and pool occupy the terraced space just below the back garden's main level. Our last stop was Articulture, part garden-oriented boutique and part event space. We ended the Fling with a barbeque dinner, an open bar featuring some of Lucinda Hutson's designer cocktails, and a band, all enjoyed in an open air setting. 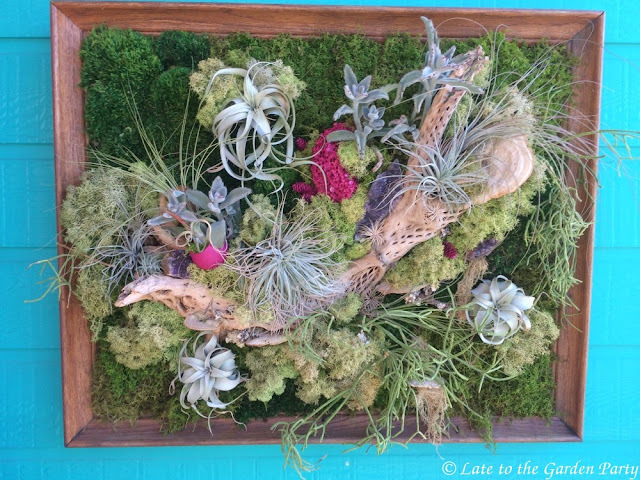 The framed succulent-Tillandsia artwork shown above was hanging on the wall just outside the boutique's main entrance. I'll wade through the rest of my photos over the coming weeks and publish more detailed posts at intervals (while also catching up on all the blogger posts I've missed over the past week). Despite the rain on the first day, the Fling was a lot of fun, just like last year's event in the Washington DC area. Even more than the pleasure of touring beautiful gardens, I appreciated the opportunity to meet and get to know so many of the other bloggers I've followed on-line. My biggest regret is that I didn't take my bigger, better (and bulkier) camera. If you're looking for something to do in June 2019, I suggest you consider the Denver Fling! Excellent retrospective Kris. I'm still slogging through my photos-but it's fun to virtually relive such a great Fling. I expect I'll be slogging through my own photos for quite awhile, Kathy. A wonderful teaser, Kris. We did do a lot, didn't we? I'm so glad you came to Austin. See you in Denver next year! Kris, thank you so much for this chronological review of all the gardens we saw. I'll be referring to it often as I write my own posts. It was great hanging out with you. Hope to make it down your way before too long. I kicked myself for tossing our itinerary in the trash when I packed my bags, Gerhard, but I think I've tracked the stops, or most of them anyway. Kris, it was really great to meet you in person this weekend. I love the theme of 'postcards' on this post. You captured the spirit of our weekend so well! Jennifer, I'm sorry we didn't have more opportunity to chat! I love seeing all the details you captured in these postcards - there was so much to see! And it was great to meet you and everyone else! I was surprised to find how few close-ups I actually took, Renee. For some reason, I seem to have concentrated on wider shots, which wasn't a conscious choice at the time. Glad you made it again this year Kris! I’ve yet to put my photos into individual files, they just all got dumped into one labeled “Austin”... but since the gardens are starting to run together in my mind I’ll definitely be refering to your post when organizing. Other than a first pass during which I trashed a pile of bad shots and identified a few suitable for use as "postcards," I haven't done anything to categorize my photos either. Complicating matters, I had to switch to my cell phone camera on several occasions when my PowerShot batteries ran out of juice so I do need to figure out which photos belong where before I forget. I'm looking forward to seeing more detailed posts from you about each garden! I followed several Flingers on Instagram and they were all posting very interesting vignettes. Are you planning to go to Denver next year? I'm still on the fence about Denver, Alison. I've always wanted to see the Denver Botanical Garden, though. There was a great deal covered in those two days, Kris, and marvellous to catch up with other bloggers. I didn't know this kind of convention happened in blogging! The gardens all look wonderful. If you're interested, check the Fling website (via the link at the top of this post) for updates. Enrollment usually starts in October or November and the slots can fill up fast. Activity packed and looked so much fun! Thanks for the recap and will be looking forward to your future posts about it. Maybe you 2 will think about joining next year's Fling? Thanks for the preview of your fling posts to come. I'm looking forward to seeing more of all of these fabulous spaces and am glad y'all had a good time in Austin! At this point, I expect I'll parse out the Fling posts but you never know - I may gain some momentum once I really delve into my photo collection. Thanks Denise. It was good to spend some time with you! Wow, you covered a lot of ground in a few days. I don't know if I'd been able to go the distance! Looks like you had a great time. I bet you'd enjoy it, Eliza. Thanks HB! I look forward to seeing your photos once you hash through them. I have been to a few Flings and I hated to miss this one. I like the way you gave us post cards of the event. I will look forward to the more detailed look at these gardens. You did good at getting pictures of areas of the gardens without people. I know it is difficult to do in this instance. I wasn't nearly so successful in navigating around my fellow bloggers in most of my shots, Lisa. Thoroughly enjoyed your Austin recap. Thank you for sharing your vision with us all. Maybe we were on the opposite buses? I scanned the photos posted on Fling website before I left but, frankly, instant facial recognition isn't one of my skills. I'm still on the fence about Denver. Thanks for a taste of the Fling. Sad it rained on the first day as they looked the most interesting gardens to me. Organising 90 people sounds amazing! Organizing a Fling isn't for the faint of heart, Christina! Some wonderful gardens here I tried but can't choose a favourite. And interesting to see the urban plantings along the creek. 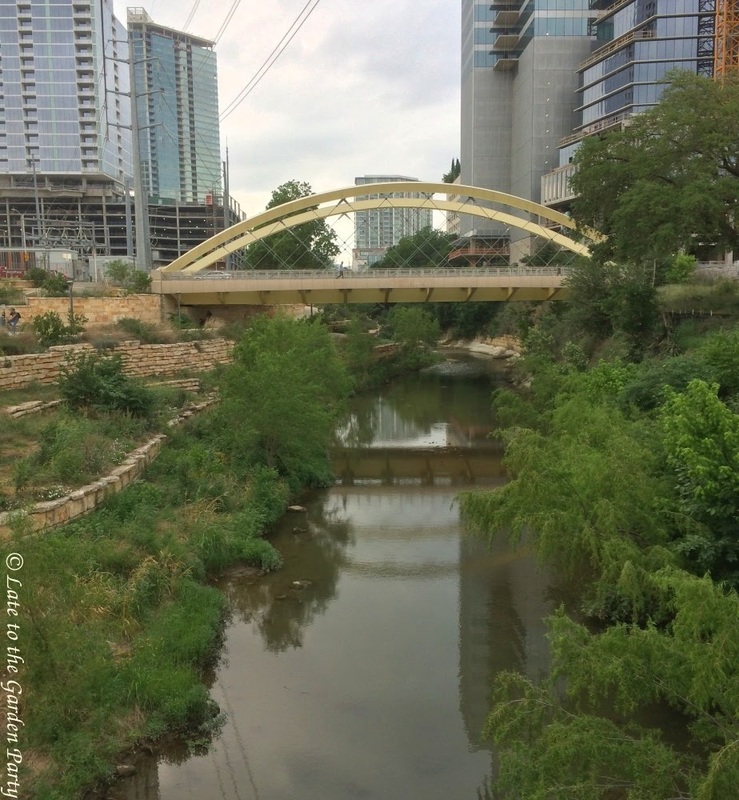 I was surprised to see how green Texas - or at least Austin - was, even in untended areas like around the creek. Texas gets really hot but it also gets more rain on average than we do in Los Angeles.